Myron Rufus Martin was an early manufacturer of bicycles (1895) and two-cylinder automobiles (1899). While in Superior, Wisconsin, he invented the Martin grain grinder, a high speed corn grinder that operated with a small gasoline engine. In March 1902 he put $500 down on a factory in St. Louis Park from Mr. L.R. Gorham of the Red River Lumber Company (T.B. Walker’s holding company), as advertised in the Minneapolis Times. There he started the M.R. Martin Company. He moved his family to the Park that June. I shall never forget the first impressions I received upon arriving in the new community. I was then a boy of but a few years, and it seemed to me that the town at that time was all factories. the T.B. 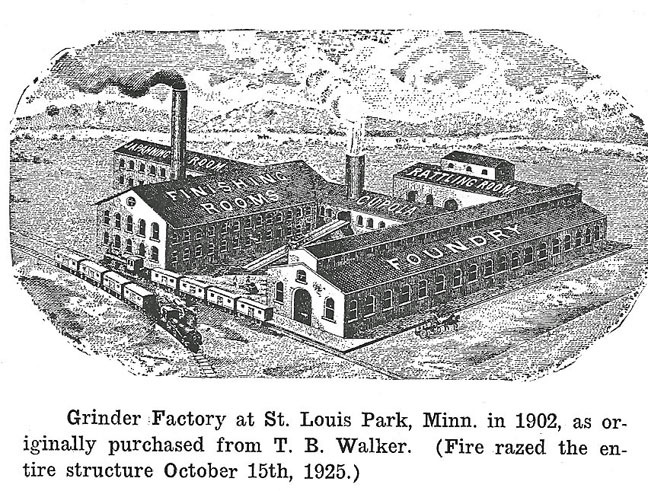 Walker interests were attempting to create an industrial area adjacent to Minneapolis, and several industries preceded our location at St. Louis Park. Chief among these was the Minnesota Sugar Company which occupied a thirty acre tract near the site of the future Martin Mfg. 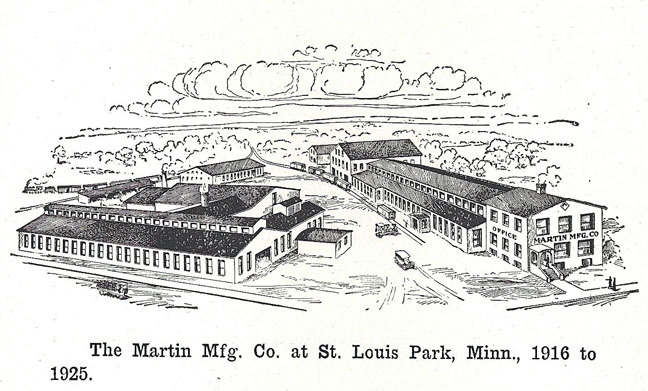 Co. Of all the industries located in St. Louis Park when M.R. Martin moved his infant grinder factory there, only one now remains and that one has undergone a change of ownership. The years that succeeded were years of toil and hardship. They were years that tested the endurance of both the grinder inventor and his good help mate to the limit. To begin with the townspeople had put over a sort of ‘hoodoo’ on the factory for the reason that several industries had started in business and for different reasons had failed. When it was seen that the hoodoo was going to fail this time instead, other situations developed. Generally communities give encouragement to infant industries starting within their borders, and some go so far as to cancel taxes against the property for a period of years. This, however, did not seem to be the attitude of the community to which the Martin Grinder builder came to live and manufacture his product. Taxes began to mount rapidly upon the factory property, and finally redress was sought from the Board of County Commissioners who acted favorably upon his petition for reduction. In the late summer of 1904 a serious tornado struck St. Louis Park destroying thousands of dollars worth of property and injuring scores. A large factory building near the Martin plant was completely demolished and the grinder factory itself did not escape injury. A whole section of brick wall was torn down and several chimneys blown over. In May of the succeeding year, the destruction of the property by fire was narrowly averted. The sugar plant just across the highway [presumably Walker Street – this was before Highway 7 was built in 1934], constituting fifteen or more acres of buildings took fire and several times during the course of its burning flying embers lodged upon the Martin plant and started fires which would soon have got beyond control but for diligent and constant patrolling. In 1907 he changed the name to the Martin Manufacturing Company. Letterhead from a letter Martin wrote on May 4, 1907, before the name change. This structure consisted consisted of a two-story and basement office building with a one story machine-shop…. The entrance of the United States into the great world war in 1917 forced the abandonment of the building project before it was quite completed, but enough of the plant was erected to cause no interference with the major plan and operation went on smoothly. The business was incorporated in 1919, with Myron R. Martin as President, brother-in-law W.E. Pavey as Vice-president, son D.C. Martin as Secretary, and W.E. Martin as Treasurer. Martin died on May 12, 1922, and the factory was razed by fire on October 15, 1925. The company then moved to Anoka. 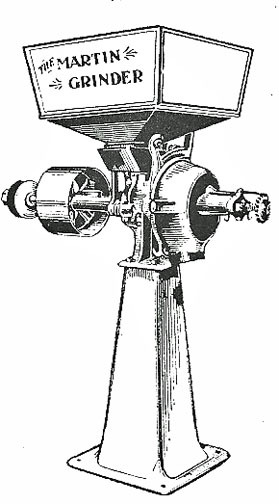 Gradually the market for small grain grinders evaporated, as the big mills ground corn for farmers. The company had been publishing a newsletter called the Gristogram, and eventually moved into printing. This continued until 1960. Myron R.’s grandson Myron C. shut down the company, and went to college to become a corporate tax accountant. This photo is identified as Martin Manufacturing, but has no date. Years later, in 1987, the site was redeveloped into an apartment complex called Newport on Seven. Myron R. Martin was born on March 12, 1858 in Janesville, Wisconsin. He married Emma Pavey on October 8, 1890, near Pittsburg, Kansas. After a peripatetic career as documented in Dwight’s biography of his father, the family moved to St. Louis Park in June 1902. In the 1920 Census the family lived on Brownlow Ave. in St. Louis Park. Myron’s occupation was listed as “Inventor.” Everyone else worked at the company: Emma as bookkeeper, Wayne as Manager, Dwight as printer. Son Bercil was listed as having no occupation. Also living at the home was Swedish servant Hulda Hofstrand, listed both as a servant and a stenographer at the mill. English sevant Clara Kelly was also an apprentice at the paper. Myron Martin died on May 12, 1922.